French painter. A pupil of Jean-Baptiste Regnault, he exhibited regularly in the Salon between 1800 and 1831. He executed a number of unremarkable academic works on Classical subjects, for example Electra (1804; exhibited Salon 1814) and Orestes Sleeping (1819; both Dijon, Muse des Beaux-Arts). Vafflard gained more success with his Troubadour pictures, which he began to paint in the early 19th century, at the outset of this fashion. They are remarkable for their absence of colour, their theatrical quality and contrasted lighting effects. One of his earliest Troubadour scenes was Emma and Eginhard (exhibited Salon 1804; Evreux, Muse Evreux), based on an episode in the history of Charlemagnes court and painted at a time when the Holy Roman Empire was in fashion in official French circles. In this sentimental painting Vafflard demonstrated his historicizing intentions by emphasizing medieval costume and Gothic architecture and seeking to create an atmosphere similar to the romans de la chevalerie, so highly thought of in France at the end of the 18th century. 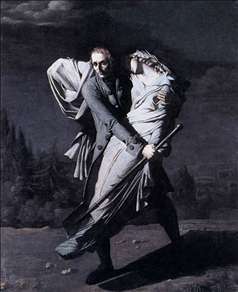 In the same Salon he exhibited a strange and novel painting, Young Holding his Dead Daughter in his Arms (Angoulme, Muse Municipal), taken from Edward Youngs Night Thoughts (published in French in 1769-70). This English poet was a rare source of inspiration for painters seeking romantic subjects, who tended to prefer Gessner or Ossian. Vafflards emphasis on the fantastic and the morbid was also unusual at this period, and these effects were further accentuated by leaden tones and a strange lunar chromaticism. See more details about "Young Holding his Dead Daughter in his Arms"